Ireland ratified the United Nations Convention on the Rights of the Child in 1992. The Convention outlines in detail the standards that apply to the needs of children, and binds States to adhere to these standards. The Convention is informed by four core principles: non-discrimination; the best interests of the child; the right to life, survival and development and respect for the views of the child. States’ adherence to the Convention is periodically assessed by the UN Committee on the Rights of the Child, an elected group of independent human rights experts in children’s rights. Ireland’s record under the UN Convention on the Rights of the Child was examined at a hearing in the UN Palais des Nations in Geneva on 14 January 2016. 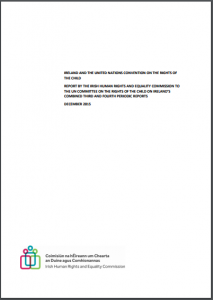 In advance of the hearing, the Irish Human Rights and Equality Commission submitted a detailed report to the UN Committee on Ireland’s record under the Convention on the Rights of the Child.